What is Calgary Emergency Medical Services (EMS)? Sometimes, health problems require more immediate or serious care. You cannot afford to wait and see a doctor for these problems because this could lead to your condition worsening. Such cases are known as emergencies. If you find yourself involved in a medical emergency, it’s very important to call Emergency Medical Services (EMS) right away. Calgary EMS is here to provide care and save lives. 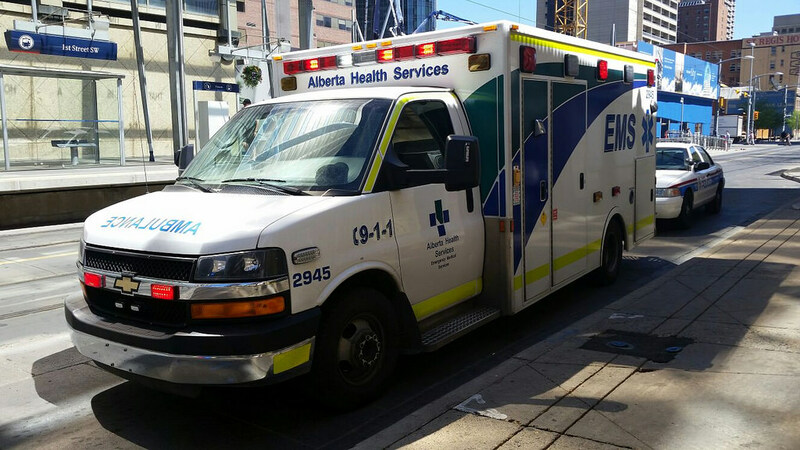 What are Calgary Emergency Medical Services (EMS)? The slogan of Calgary EMS is “Saving Lives, Improving Care”. Calgary EMS is a group of emergency medical professionals who receive and respond to nearly half a million calls each year. It is their job to transport a patient to a medical facility (like a hospital) and treat them until they arrive. You can think of Calgary EMS as a network. Everyone has a job that helps them care for emergency medical patients. There are dispatchers and communication officers who receive calls to send ambulances. Ambulances are driven (or flown) by paramedics. Paramedics are also trained to provide emergency medical care until a doctor can take over. When do I call Calgary EMS? Calling an ambulance can be scary, but doing so can save your, or someone else’s, life. It’s very important that you recognize what situations are best to call Calgary EMS about. These are not the only reasons you should call an ambulance. If you are in doubt, it is best to care for your health first. Always call an ambulance if you feel that it’s necessary. How do I call Calgary EMS? Alberta Health Services has many emergency phone lines that provide information and support. These numbers are available 24 hours everyday. Find the phone numbers here. For medical emergencies that require immediate attention, call 9-1-1. Provide your location. An accurate location is important to getting help fast. Provide your phone number. This will allow the dispatcher to call you back if a disconnection happens, or if they need more information. Answer any other questions the dispatcher has. Follow the directions the dispatcher gives you. Stay on the phone until the dispatcher tells you that it’s okay to hang up. Do not hang up before then. What happens after I call 9-1-1? The dispatcher will ask you to confirm your location and phone number. Once your location is confirmed an ambulance will be sent. While the ambulance is on its way, the dispatcher will keep speaking with you to get as much information as possible. The dispatcher will give you instructions to help the patient and prepare for the ambulance’s arrival. Depending on the situation, the dispatcher may stay on the line with you until help arrives. Thanks to Asantewa Nkuah for help with this guide. If you want to suggest a correction to this guide, or want to submit one of your own, please contact us.